In an issue of constantly shifting perspectives, the strongest moment comes not from another brilliantly layered, visually exciting panel, but one of relative quiet. A Study In Pink #5 underlines Sherlock’s questionable application of the law – sure he knows the letter but in practice, well, that’s a different matter – we open with a drug bust and, as recriminations give way to accusations, there’s one quiet panel where speech bubbles simple hang in the air, imposed upon that familiar wallpaper. It’s both conspiratorial and intimate, Holmes and Watson, still teasing out their burgeoning relationship decide to trust each other. Underneath the machinations of the plot, it’s a subtle way to convey how the two men approach each other – the room is waiting for how they respond, the raid is basically for show, Lestrade could turn the flat over in minutes – and you must wonder if he has before in the five years they’ve know each other. Perhaps he has turned a blind eye to Sherlock’s unusual methods of deduction because, as he says, he’s stuck – Sherlock knows this and remains guarded, fighting off John’s protestations of his innocence. One wants to believe in what the other promises and the other doesn’t want to crush that promise – they both want to believe in whatever this partnership might become. At this point, Sherlock isn’t a hero; he isn’t as emotionally connected to those involved in his daily life – his choices are not always correct. At this moment, it’s questionable whether or not he will rise to the challenge that the word ‘hero’ brings. For now, he’s evasive, stepping around each problem when a simple answer would prove to be more emotionally satisfying. 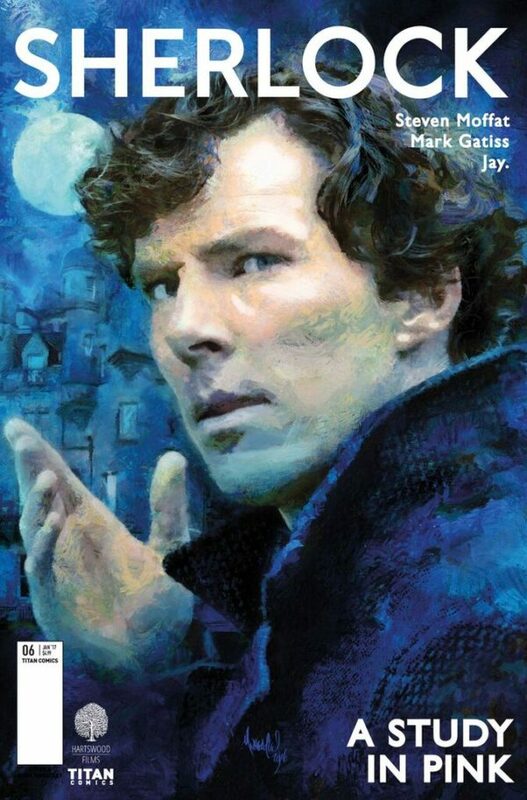 It’s not the only time that the issue plays with our perception of Sherlock through its superb artwork. 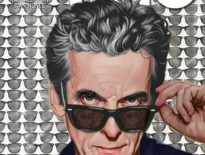 The issue finally introduces the villain behind the recent spate of enforce suicides and, while it’s disappointing that we aren’t given a manga Phil Davis, we do get an unsettling presence perhaps absent from the episode itself (Davis prickled with barely contained fury where here, our villain often maintains that sense of mystery with a snide unsettlingly smirk). Jay. makes great use of the peak of his cap and the glare of his glasses to hide his true intentions. As we cannot see his eyes, Sherlock cannot either – adding a layer of obfuscation to the tense power play enfolding through the dialogue. Here Jay. limits his options down to panel/reverse panel, keeping us within each character’s line of sight, allowing each perspective – a quick glance at a taxi licence, a momentary glimpse of a family photo – to build layers of intrigue. Just like that characterless panel from earlier in the issue, we learn just as much from what is shown as we do from what is concealed. 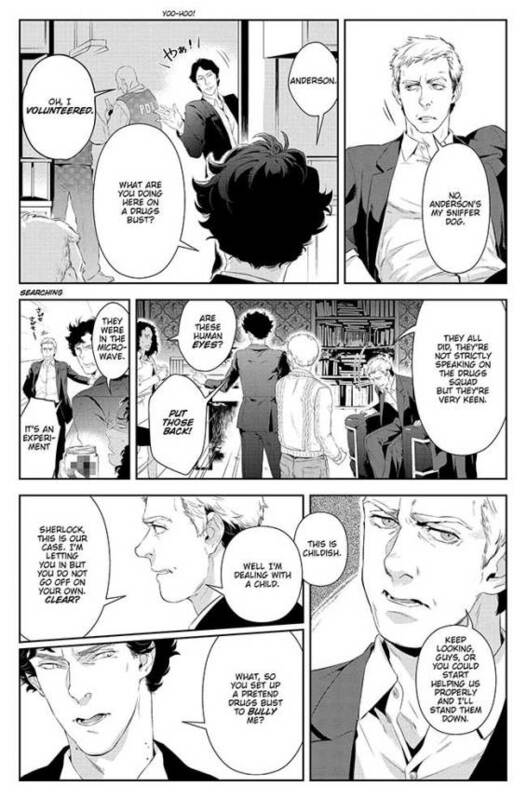 The stand out panel of Sherlock looking down the barrel of a handgun is not only the most eye-catching, it also works alongside to underline the dialogue. The image captures both his disappointment at being reduced to a simple captive and the villains uncertainty about using the firearm. 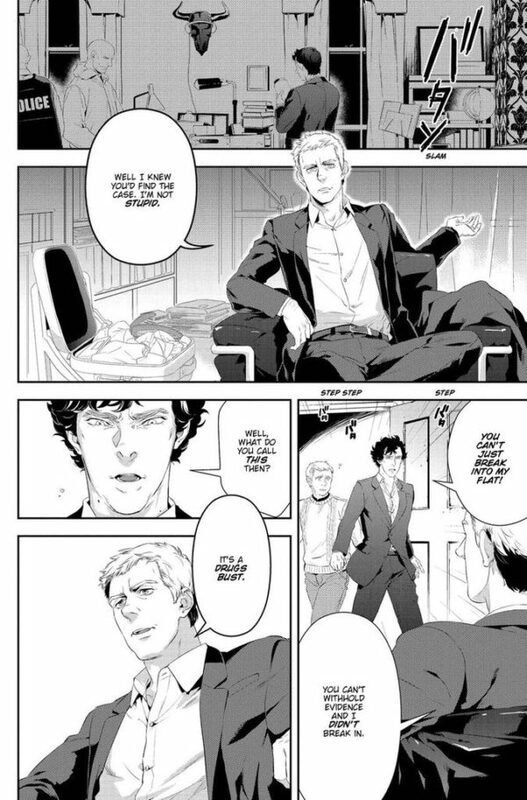 Sure, it’s one thing to say that he didn’t think he’d need the gun because of Sherlocks interest in him, but it’s an entirely different thing to still bring it. As the saying goes, it’s better to have it and not need it, than to need it and not have it. 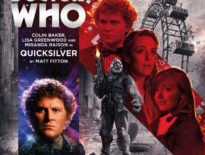 Or, like the episode itself, it highlights perhaps the weakest part of the mystery, and in fact modern mystery shows entirely, a hero with a pathological need to solve puzzles, who reduce great or at least equal men to baser actions to stop them when they are outsmarted. As A Study in Pink reaches its final issue, Jay. continues to impress with his bold, confident storytelling. 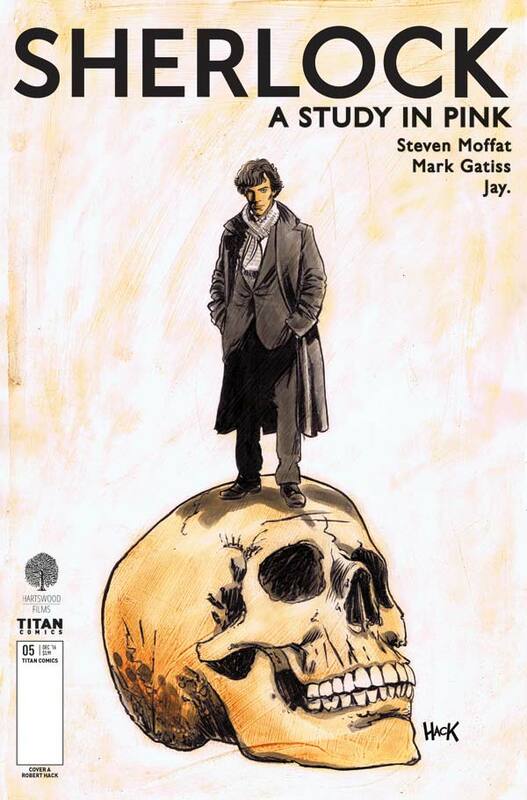 Titan Comics Sherlock – A Study In Pink #5 is available as part of the collected Sherlock: A Study in Pink Vol.1 digitally via Comixology for £4.99 and in paperback for £9.99 from Amazon.